Jony Ive is well known for being the design guru at Apple, and in one of the more revealing looks at the man offered by The New Yorker (a great read for designers and Apple fans in general), you’ll find a description of a rather colorful, perhaps even offensive, poster on his office wall. 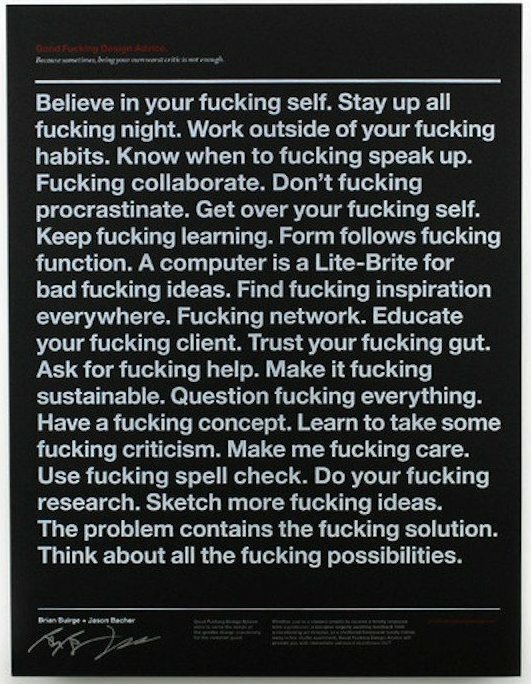 If you don’t like the F word you’re going to find this poster very offensive, because there’s an F word in every sentence. We’ll keep the topmost image blurred out to give you an idea, but you can see the full uncensored version below. Of course, if you really like the F-ing poster, you can even buy one yourself. If you want one of these yourself, they can be bought for $100 from here at the Good F’ing Design Advice store. There’s even a “family friendly” version, which presumably just drops all the F-bombs, or maybe just stars them out like we did. The creators say the poster will “provide a sense of purpose and class to your workspace” – LOL. This amusing find came from @MacGeekPro on Twitter. I find this to be incredibly poor taste, which considering the horrendously poor taste appearance of OS X Yosemite, is perfectly appropriate for Jony Ive! So Jony Ive is a 15 year old at heart, that’s great. Oh and I think this does a lot to explain the terrible icons of iOS too! You can get this poster at FAB for $29!! Your comment ignores all of the other beautiful things Ive has designed for Apple, including the Mac Pro, iMacs, iPods, iPhones, iPads, etc., etc. So you’re offended by a single word. Nobody cares. I find it kind of pedestrian, akin to putting one of those ironic motivational posters about management on your office wall. No! Erjel essentially said it is poor taste – that’s great. It is called irony. Offended by a single word and then drawing hasty conclusions based on just that word… Who’s the 15 year old may I ask? The one on my wall just says, “Keep F***ing”. I find the poster Fuking beautiful, just like Fuking Yosemite. If you take out all the F words, it still gets the message across and reduces the text by about a half. That’s the type of elegant solution Jony Ive would have figured out. I am so completely bored by the f word. It’s like having a mind with one syllable. I couldn’t agree more. It’s like a teenage bully who has to act all butch just to get people to think they are bad-buttocks. I’m not impressed. You want to impress me? Show me you can take out a sentry without him knowing you were even there; Hit a double-high-C on the trumpet and hold it for more than 2 seconds; Play classical arpeggios on an electric guitar like Yngwie Malmsteen; Write some Perl code that actually works and does something useful. Otherwise, keep moving….nothing to see here. Obviously Apple’s attitude towards it’s customers & their HR people towards possible new employees. A little proof-reading would make your comment understandable. Or not. But there is one more line missing: the F*’em all, you first of all need F*’em all money! 100 dollars? You’ve gotta be f***ing kidding me. I read that whole New Yorker article. Man that was long, it was pretty cool though. Got an insight into his mind. I like the interface of iOS 7 and Yosemite, some of the colors are crazy and its a bit cartoony. But it’s funny how many websites changed their design language to match it and changed their main fonts to Helvetic Nue a few weeks after iOS 7 came out. Also iOS 6 now looks dated, and in the article they say that they keep they last product next to the product they’re designing, and feel like they’re getting somewhere once the new design has made the old design look dated. Which is why when a new Apple product comes out, you start looking at your current product as kind of ugly. And only appreciate the design again after a few years has past. Or at least that’s my experience. Except for the iBook laptop, that’s still gross. If you read it taking it in the literal sense–you know, coitus–it takes on a whole new and far funnier meaning. Do your research, indeed! Sounds like Malcolm Tucker’s poster :P.